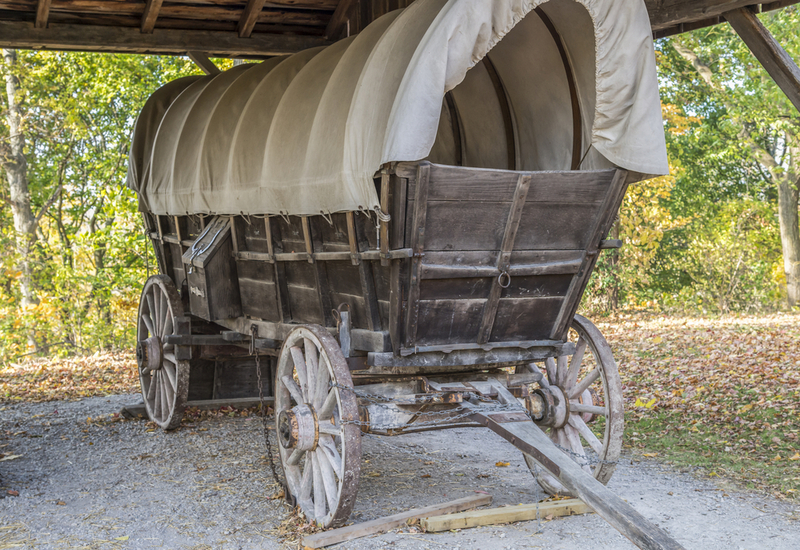 If you watch enough old western movies or TV shows, you’ll likely see covered wagons traveling over prairies and across deserts as Easterners braved the frontier westward. And if you’re like me, you might mistakenly call them a Conestoga Wagon. In actuality, these wagons were updated versions and are referred to as Prairie Schooners as their billowing white covers crossing the prairies resembled the sails on a schooner sailing across the water. Conestoga Wagons actually preceded the use of Prairie Schooners and were designed not for transport of humans, but for cargo. 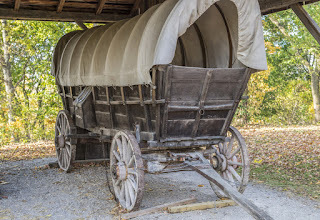 In fact, the first known Conestoga wagon was built in 1717, named after the Conestoga Valley in Lancaster County, Pennsylvania in which it was built. These early “workhorses of the American Road,” as Conestoga expert Ned Hector calls them, ranged in size from 14 to 26 feet and could weigh up to 3,000 pounds, without freight onboard. They were typically pulled by three teams of horses, although sometimes two teams. There were no seats on these wagons as the teamsters either walked alongside or rode the horse on the left, directly in front of the wagon. Some wagons had a “lazy board” which was pulled out from behind the front wheels and allowed a teamster to sit. I imagine the lazy board was a relief for sore feet on long hauls. 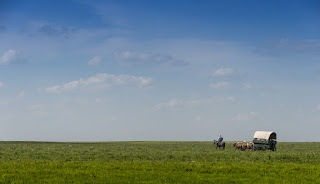 The horses were fitted with arched harnesses that carried bells—five for the lead team, four for the middle, and the right wheel horse (where the driver did not ride) carried three bells. These sound-makers served the purpose of alerting others on the road that a team was approaching on the narrow highway. If the bells were silenced, another wagon on the opposite side would know the oncoming Conestoga had pulled over to allow them passage. If a wagon broke down, protocol dictated that anyone who assisted the teamster to get back on the road would be gifted the bells as payment. So the term, “I’ll be there with bells on” originated with wagons who arrived fully bedecked after a successful drive. 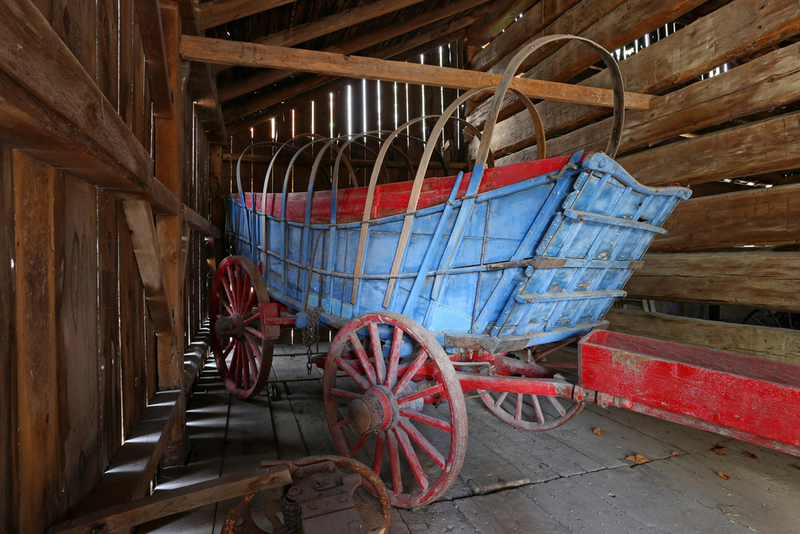 Conestoga wagons were made from seasoned wood, air dried for three to four years. They were equipped with a feed box, a water bucket for the horses, a tool box, and a tar bucket to grease the wheels. Wheel lock chains were used for going down steep hills so the wagon did not run into the horses. 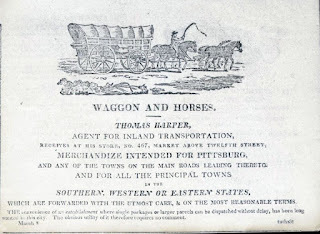 Wagons filled with freight generally traveled ten to twelve miles per day. They traveled on the right side of the road since the teamster rode the horse on the left. This began the tradition in the United States of driving on the right side of the road. How interesting! I'm surprised they were painted. One would think that would be a luxury in those days. And I love knowing about "being there with bells on". Thanks for the post! 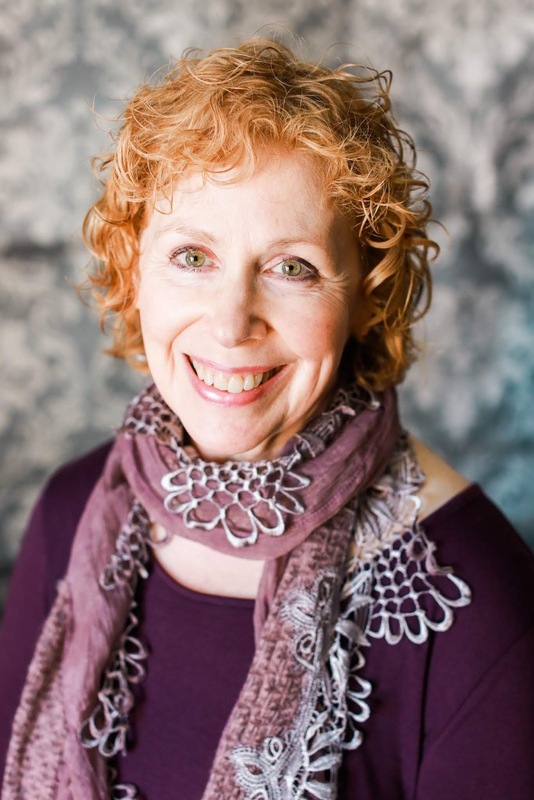 Hi Connie! I was surprised about the paint too! I think I was the most surprised at finding out how early Conestoga's were built. Thanks so much for commenting. Great post, Elaine. As a wordsmith, I find the history of phrases fascinating and "I’ll be there with bells on” is delightful. Hi Anita! I remember my Mom saying that phrase and always wondered what it meant! LOL! I love the source of unique phrases in our language as well. :) Thanks so much for commenting. 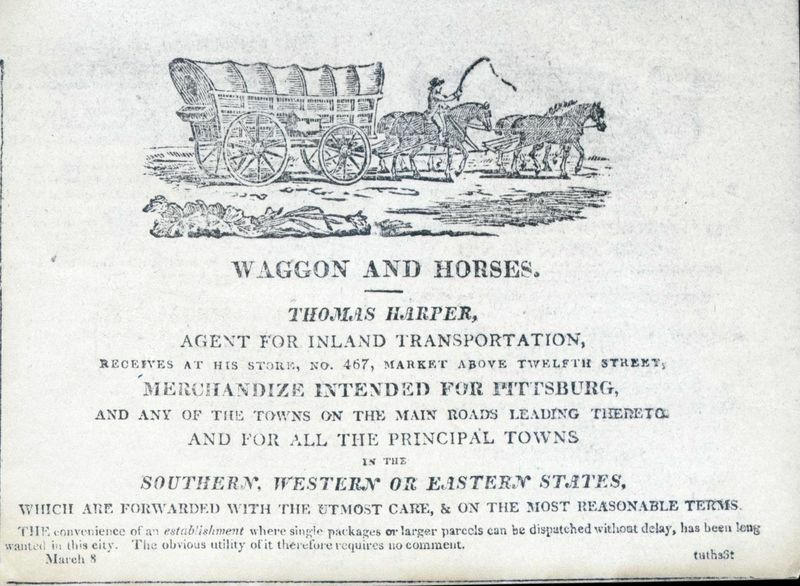 An ancestor brought his "household goods" and family (pregnant wife and six children) to Iowa from Ohio in 1855 in "two wagons." I've wondered whether they were Conestoga or Prairie Schooners or what? And where and how they got across the Mississippi River! Such interesting family history! Crossing the Mississippi was definitely a challenge. Often the travelers made it across the river when it was frozen solid. Tricky and scary business! Sometimes I believe they used rafts to transport or found low areas where they could drive the prairie schooners across. No matter which way they did it, it was quite dangerous. It was likely Prairie schooners at that point. Thanks for the info on Conestogas. I'm getting ready to do a wagon train story. I didn't realize that the drivers didn't ride on the wagons, so that's very good to know. Usually wagon trains were a group of prairie schooners, not Conestogas. Prairie schooners did have seats for the driver. Hope that helps! Best wishes on your story!